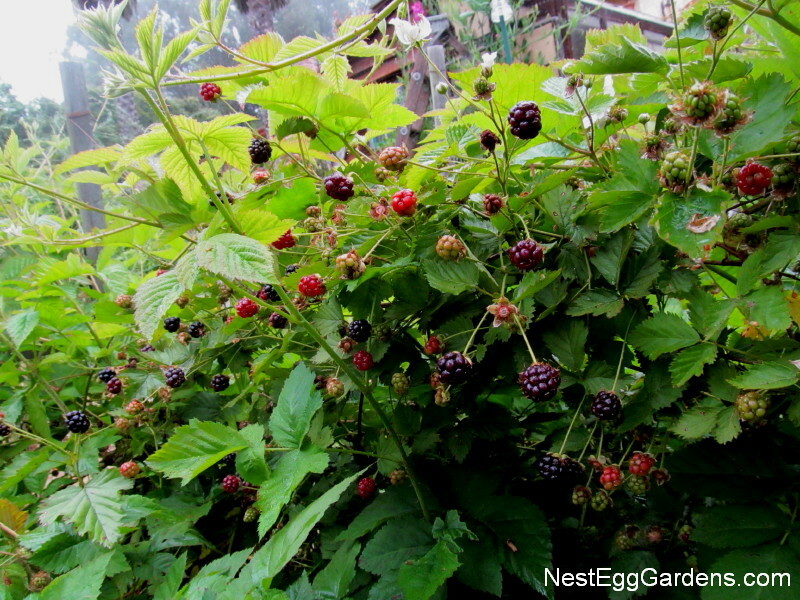 Our berry bushes (mix of blackberries, raspberries and olallieberries) have produced like never before this year. The new vines that will bear fruit next year have had to be cut back so I can get in there to pick them… a bowl like this every 2 or 3 days! I can’t make pies fast enough, and there’s already bags in the freezer for those fruitless winter months. This entry was posted in Flora, Food, Garden on June 10, 2016 by Shelly. The warm winter weather has brought berry season early this year. There are tons of them… which means berry pies galore! 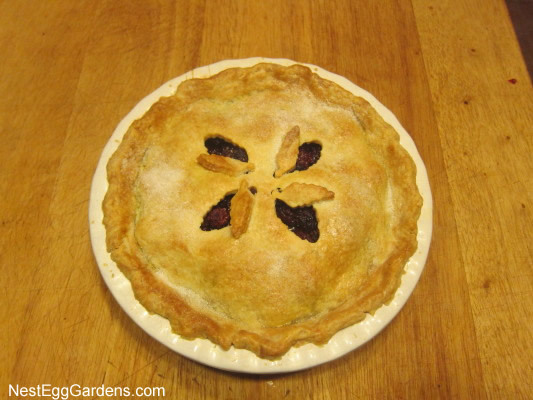 This entry was posted in Flora, Food, Garden on May 18, 2015 by Shelly. 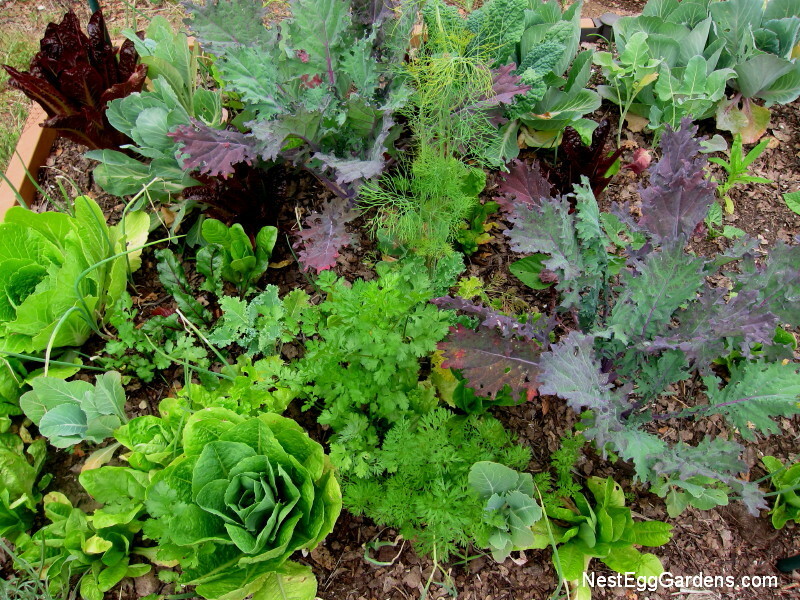 Time to start harvesting cabbage, lettuce, kale, cilantro, green onions, dill and beets. This year we plan to mulch this raised bed with straw instead of planting summer vegetables. Since we normally don’t get rain until October, we’re just trying to do our part to conserve water during California’s historical drought. We’ll buy vegetables at the farmers market, hoping for weather patterns to change… and plan to start back up in the fall. This entry was posted in Food, Garden and tagged Spring on April 21, 2015 by Shelly. 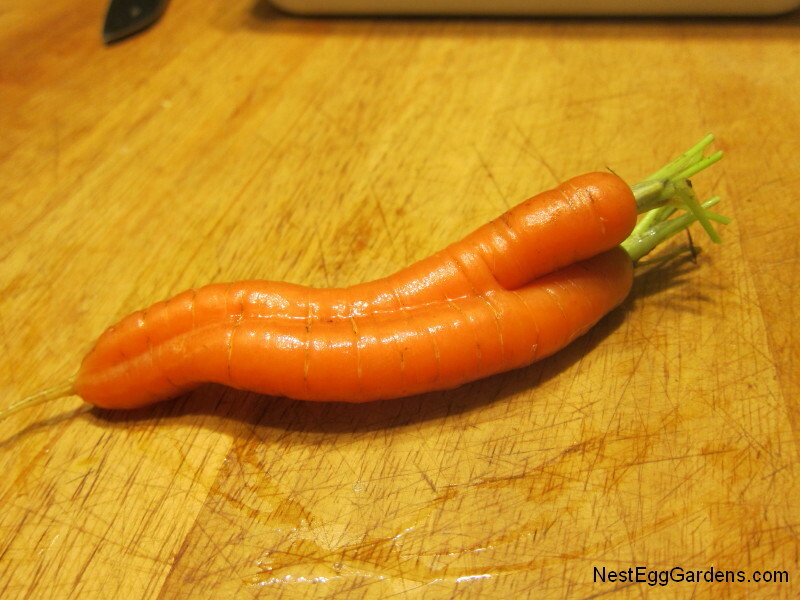 These two carrots grew all cuddled up together… almost too cute to eat! 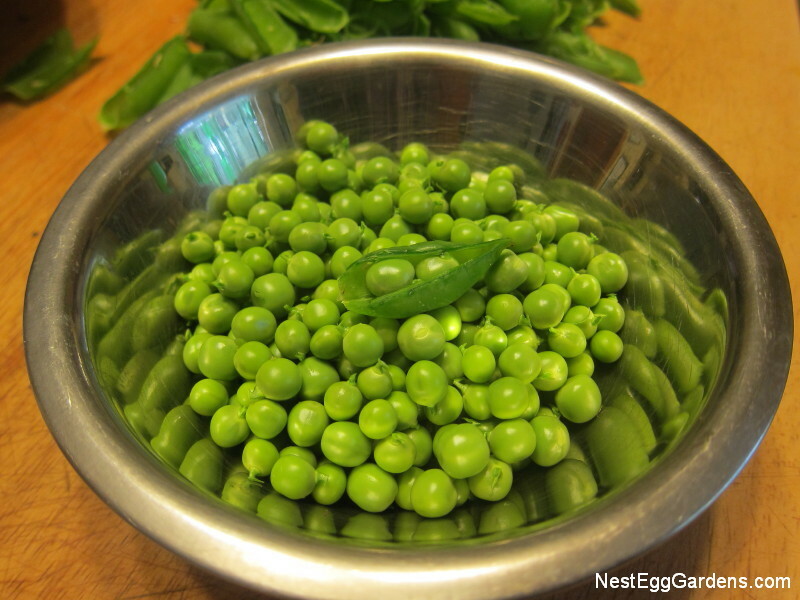 We are also enjoying the last bowl of spring peas before the vines come out to make room for bush beans. So sweet and fresh, for every pod that’s harvested, one is eaten right in the garden. Peas are planted in September (along with Sweet Peas), which gives them time to shoot up about 6 inches before winter sets in. 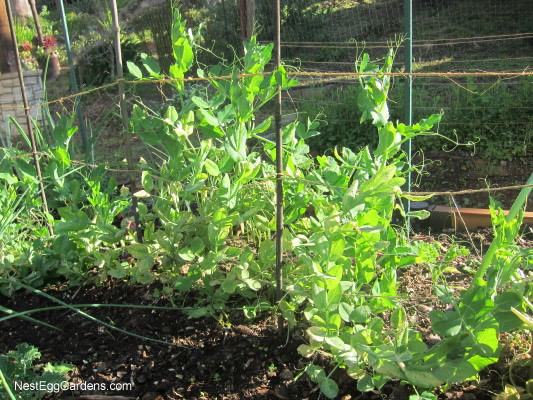 Peas don’t mind frost and cold weather, and grow like crazy once the weather warms up a little. They produced really early due to our unusually warm winter in California this year. This entry was posted in Food, Garden and tagged Spring on April 6, 2015 by Shelly. 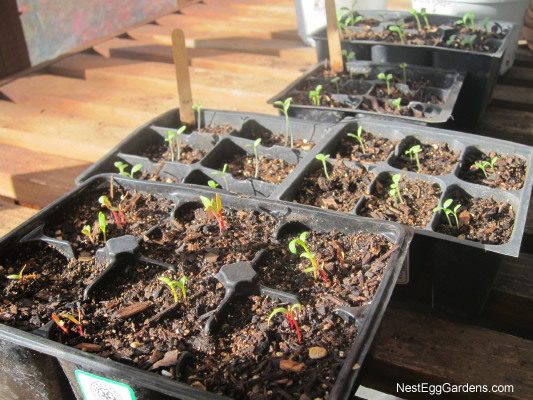 These vegetable seedlings are ready to transplant into the raised bed. 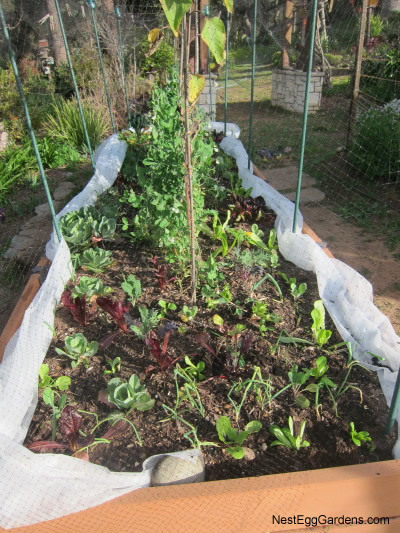 Lettuce and Swiss chard join kale and other greens. Covered the seedlings on both sides of the peas with lightweight row cover material to help with the transition to outside… protecting from the cold and bugs, while allowing rain to penetrate. This entry was posted in Flora, Food, Garden, Garden Shed on February 5, 2015 by Shelly. 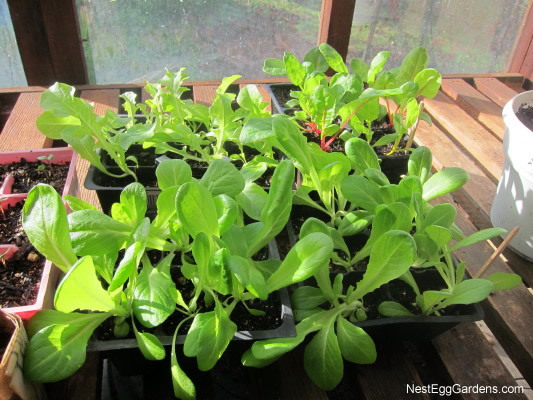 New lettuce, kale and chard seedlings are sprouting up in the garden shed. The propagation mats get plugged in on New Year’s Day. Then we get busy sowing seeds, since our average last frost date is Feb. 11th. When the seeds sprout, they move off the mats to make room for more. Then a shop light on a timer (12-14 hrs/day) goes up… suspended close to the seedlings. After a few weeks, the plants are hardened off and planted on the grounds. This cycle continues throughout spring. 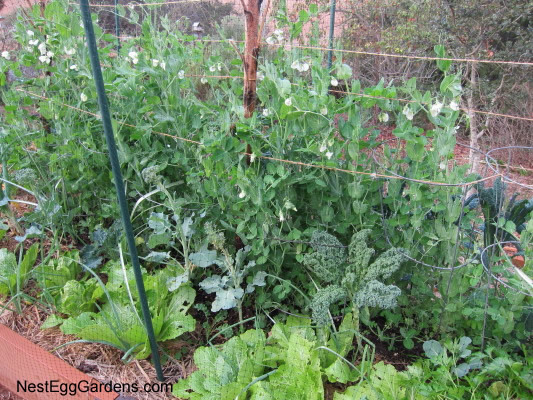 The peas that were planted mid-September are starting to climb the string trellis in the garden, and should pick up speed now that the days are getting longer again. The compost that has been cooking for months gets turned and half gets layered with more chicken straw, kitchen waste and oak leaves. 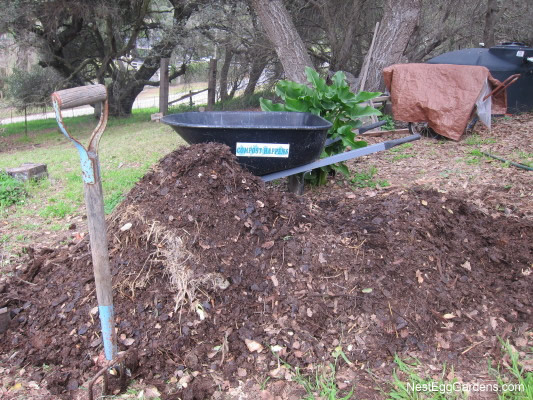 The bottom layer of rich compost will go into the garden. 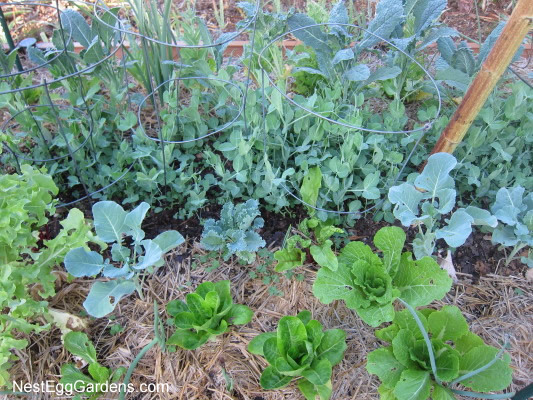 This entry was posted in Food, Garden, Garden Shed, Grounds and tagged kale, Winter on January 12, 2015 by Shelly. The Fuji apple tree did very well this year, bearing tons of fruit, which we’re just starting to pick. Used a lot of gray water to irrigate it this year because of the drought. Planted scented geraniums underneath it a couple of years ago to deter the codling moths, and it looks like only 10-20% worm damage. 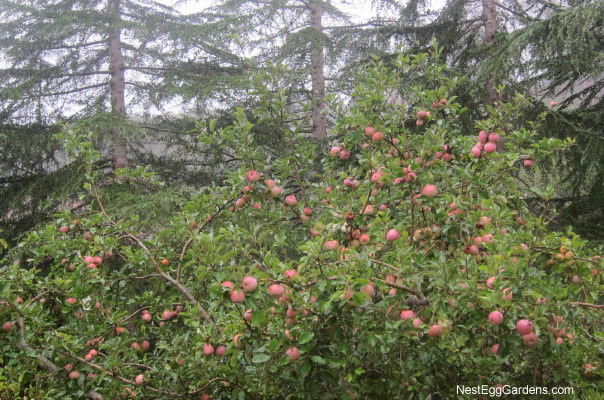 The wormy apples end up going to the deer, so it’s all good. This entry was posted in Crawlers, Deer, Flora, Food, Garden on September 25, 2014 by Shelly. The three different colors of beans are pretty as a picture. 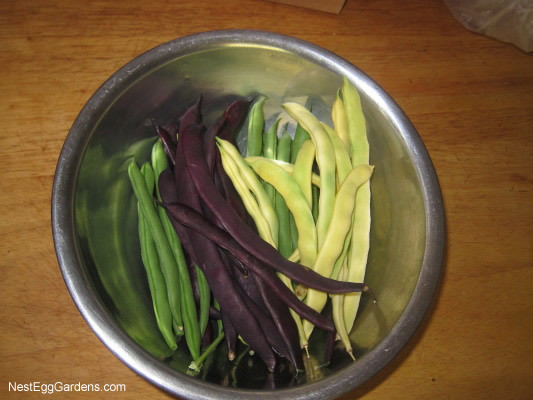 It’s interesting that the purple and yellow beans turn green when they’re cooked. Delicious sauteed or steamed… maybe some garlic and/or a splash of balsamic vinegar. 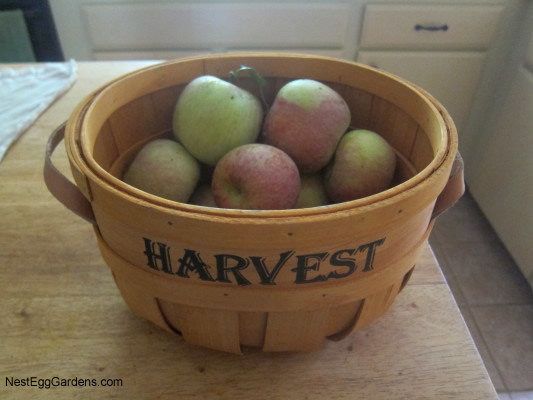 This entry was posted in Food, Garden on September 17, 2014 by Shelly. It’s been a great year for onions in the raised bed. These started as tiny seeds in early spring. Having a few green onions when you need them is the best. Then the rest of the bunch doesn’t get slimy in the refrigerator after you paid 10 cents a piece. 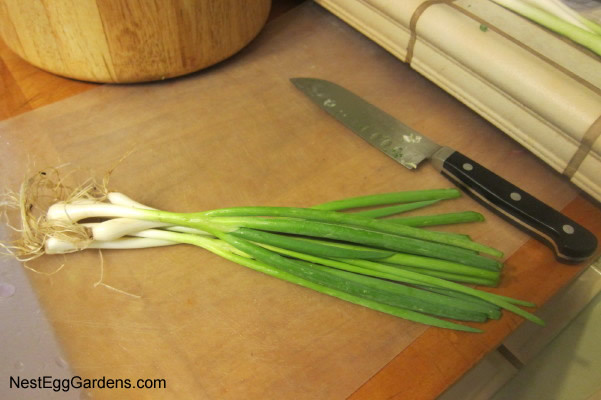 The onions that don’t get picked as green onions, grow up to be regular white onions. Dry them in the sun for a few days and store in a dark, cool place. They last forever. 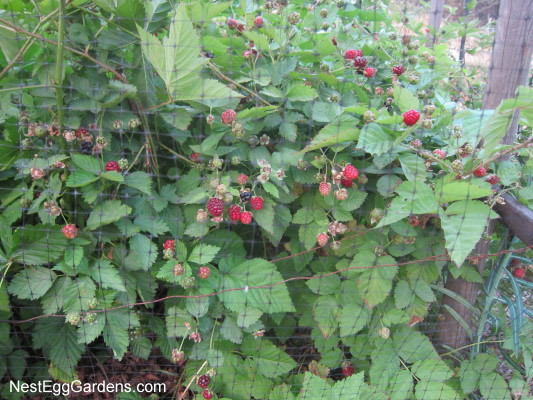 This entry was posted in Food, Garden on September 8, 2014 by Shelly. 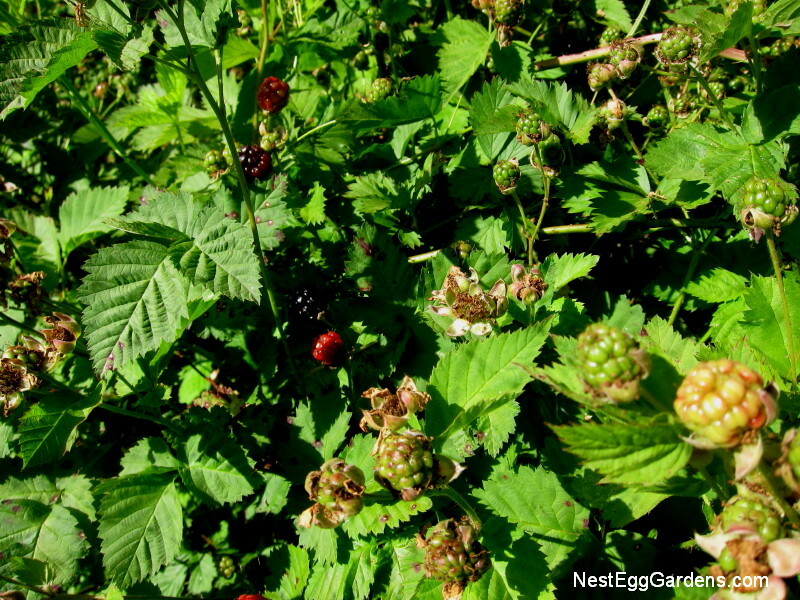 The Nest Egg Gardens berry patch is having a record breaking season! Two years ago deer discovered the berry vines and ate them to the ground. Up went poles for a bird netting fence, using the same technique as around the vegetable garden. The bed was mulched with compost and given some deep soakings. The payoff has been weeks of picking a huge bowl every other day. Our favorite way to eat them when they are fresh is in pie form (see easy recipe below). I’ve been making pies for us (and everyone else), and freezing the rest. Frozen berries work better in cobblers or smoothies. Blend 3T tapioca until fine and mix in sugar (1/2-1C). 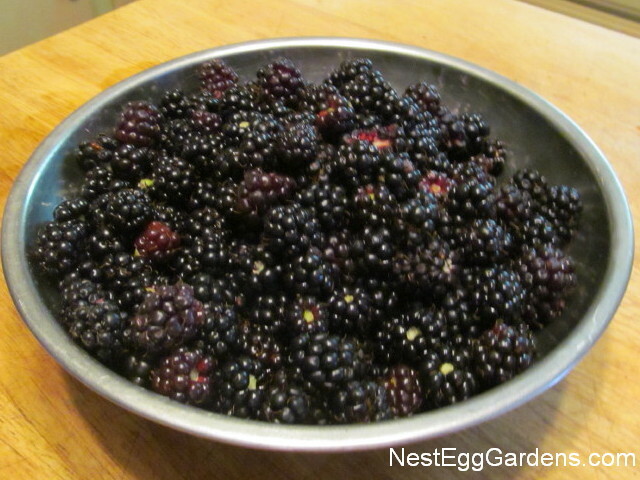 Stir into berries until well coated and let rest for 30 minutes. 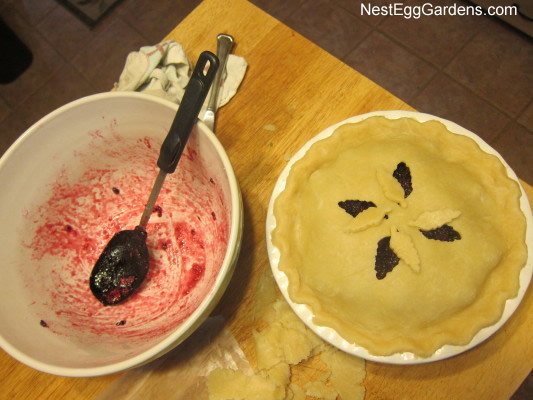 Pie crust: Add 1T salt to 2 1/4 C flour in large bowl. Add 2/3C oil and 1/3C milk. Stir until well mixed and roll out between wax paper. Bake about an hour at 350 degrees. This entry was posted in Food, Garden, Grounds on June 10, 2014 by Shelly. Peas, broccoli, Chinese cabbage, lettuce, onions and cilantro. This entry was posted in Garden on December 12, 2013 by Shelly. Peas, kale, Napa cabbage, Swiss chard, broccoli, and lettuce coming along nicely. This entry was posted in Garden on October 24, 2013 by Shelly. One of the benefits of having your own vegetable garden, is being able to pick just the right amount of green onions (cilantro, basil and parsley too). Sure, the fresh picked flavor is wonderful (and organic). 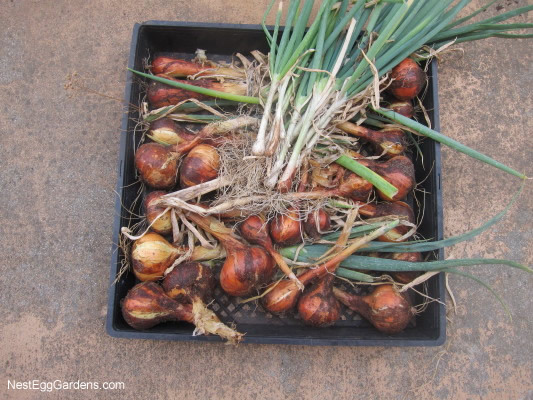 But these often used ingredients usually cost $1 a bunch at the store (that’s 10+ cents an onion), and it seems like most of the time, part of the bunch gets slimy and ends up in the compost pile. 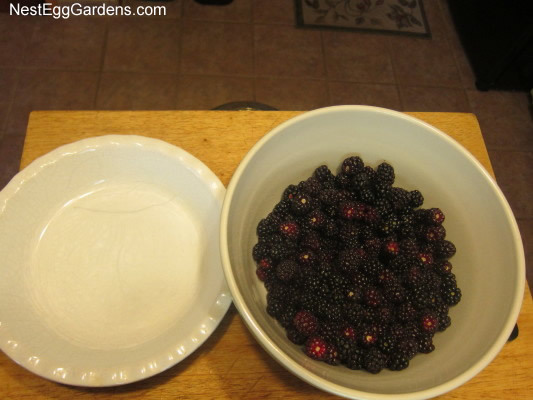 This entry was posted in Food, Garden on August 27, 2013 by Shelly. The first bowl of fresh picked green beans were delicious, along with zucchini and yellow summer squash harvested today. We have mulched with straw to conserve moisture and planted a few sunflowers in the safety of the raised bed. Surrounding the garden with poles and hanging bird netting has proven to be a excellent way to keep the deer from using the garden as their personal salad bar. Clothespins weigh down the netting and it’s easily flipped over the top to get in for weeding/watering, etc. The already 5+ foot sunflowers will provide filtered shade for half the day, which helps keep the lettuce from bolting. They are the ‘Kong’ variety… and we think they are going to be huge! This entry was posted in Deer, Garden and tagged Summer, sunflower, zucchini on August 1, 2013 by Shelly. The garden back in Mid-June before the last of the broccoli was harvested. Put in green beans, sunflowers, and lots more lettuce, spinach and kale. That’s Rose the cat in the background and the patriotic shirt hanging from the tree serves as both decoration and a deer deterrent. This entry was posted in Deer, Garden on July 22, 2013 by Shelly.